My mother had always used hand lotion at night. I didn't understand why until I grew older, and found my hands getting dry as well. Whether it's from washing dishes, you job, or just the weather, a little extra moisture is often required on the hands. Fortunately, there are products like Earth Science's Purfection Hand Cream, an intensive vegan lotion. This lotion is quite effective. I especially like using it at night, as it is intensive and is a great way to restore moisture overnight. It is moderately priced (around $13 for a 4 oz. bottle), but a little goes a long way. It rates a low to moderate 3 on the EWG Skin Deep database. However, this is weighed down by the fragrance, and the company only uses essential oil fragrances, so I suspect the rating is a little high. I was very glad to see this is a vegan-friendly formula, but it might be nice to see an unscented version. 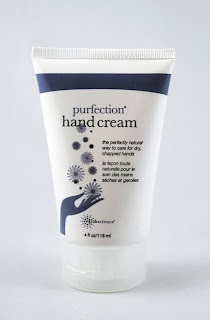 If you're looking for a natural hand lotion, the Purfection Hand Cream is a great option.